Local breeders with whom we co-own/co-breed dogs. out of AmCH/U-CH/Int'l CH/FinCH Jaron's Tham-B Bhai Rah Vahr. with a 3 point major at the Houston KC show under Ms. Toddie Clark. She is the third American champion for her dam AmCH My Thai's Saturday Night Dance ROM. 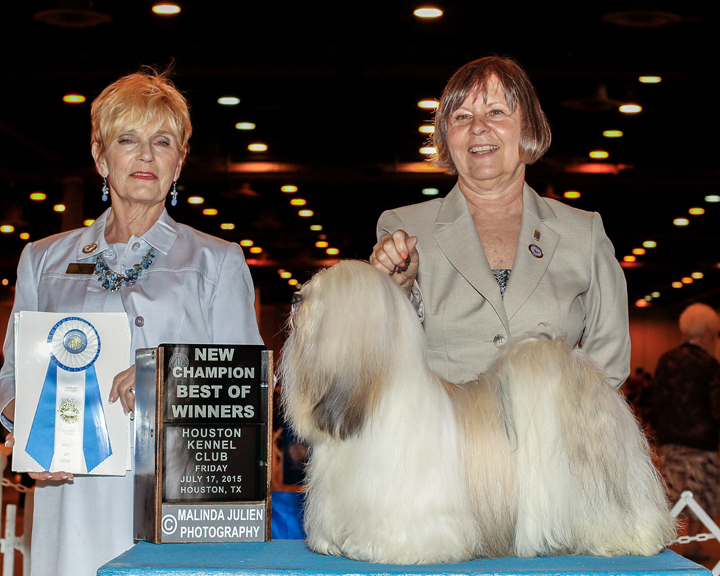 and the forth champion for her sire AmCH/Int'l CH/U-CH Jaron's Raja of Rushmar ROMelig. 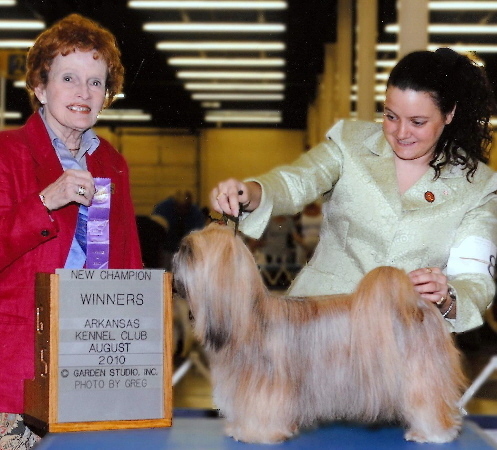 BB is the dam of AmCH GCH Jaron's Romajo Ode to Egoiste co-bred by Jaron's Lhasas. under judges Mrs. Doris Cozart and Mrs. Carolyn Herbal. In UKC Sparkle won the Companion Group on her way to her championship as well as Best in Group for her International Championship. 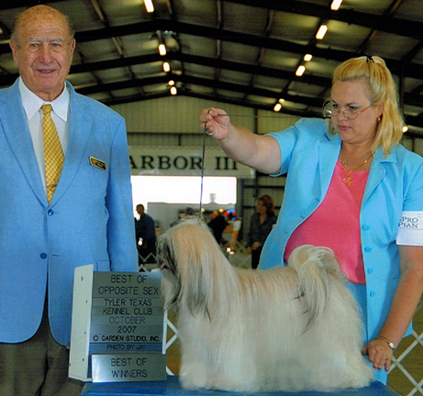 Sparkle was the first champion for RomaJo and was exclusively handled by Robert Jones. who finished his championship at only 7 months old. also co-owned by Romajo Lhasas. Introducing Neelam Lhasas latest star! Sami in her first AKC show picked up her first major and finished her championship with 4 majors. 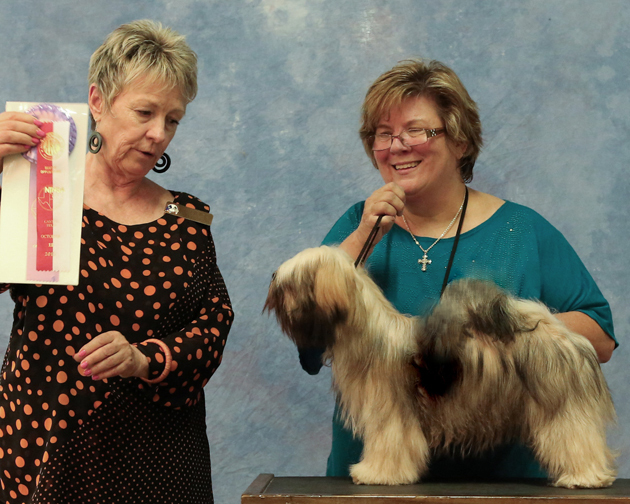 sired by AmCH/Int'l CH/U-CH Jaron's Tham-B C-Keih Won. 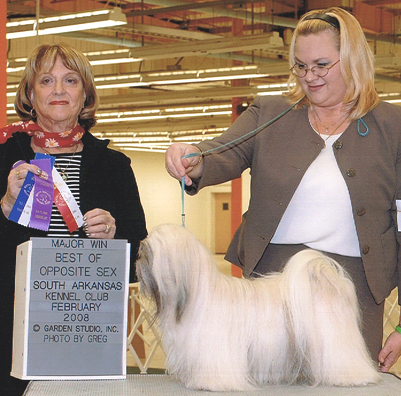 Saphira was awarded her second major going Best of Winners at the Arkansas Kennel Club show under judge Mrs. Anne T Fleming. Also thanks to Mr. Don Sutton for awarding Saphira's first major. 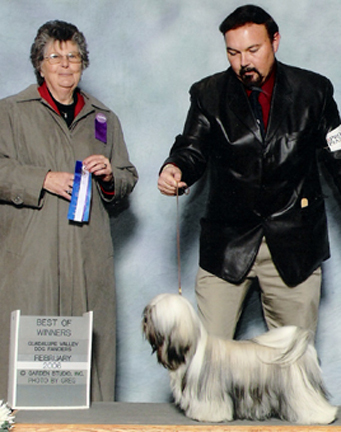 Saphira is now only a few points away from her American Grand Championship! At the 2010 Lone Star Summer Sieger International Show in Hutto, Texas Saphira completed her title in only 3 shows with 3 ratings of V1. She was also awarded a Non-Sporting a Group 3 under Dr. Steve Keating - Int'l & USA. Also thanks to Ms. Jane Roppolo - Int'l & USA and to Mr. Richard Samide - USA for their kind consideration. where at just 8 months old she earned her final competition win along with her UKC Championship. 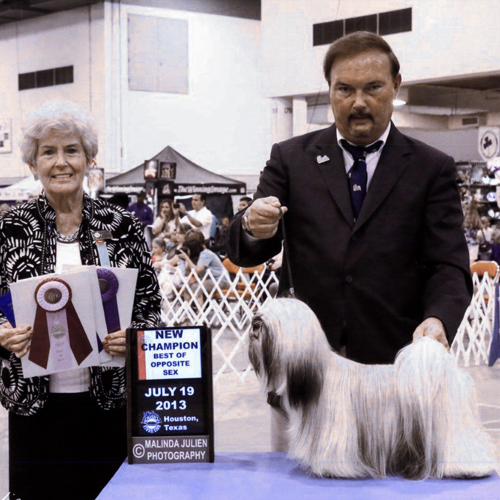 Saphira is co-bred by Melanie LaPoint and Jaron's Lhasas and is the third American Grand Champion of her dam Lamel Awesome Blossom ROM "Lilly"
Saphira is the dam of AmCH/BIS U-CH Jaron's Tham-B Sha Neelam and AmCH/Int'l CH Neelam Golden Sami. "Snuggles" finished his United Championship at only 7 months old and at 15 months completed his International title in only 3 shows. Snuggles completed his American Championship with 3 majors.